In early 2015, Singleton and five other school district staff members completed Youth Mental Health First Aid Instructor training. The program teaches adults how to support young people who are experiencing a mental health or substance use challenge or crisis. The district’s Director of Student Services, Lisa Garcia-Stewart, says those certified as Mental Health First Aid Instructors – including Singleton – have reached out widely with training to mental health counselors, school counselors, liaisons, community volunteers, churches, district employees and members of the PTA. This a model that has been replicated nationally. In 2016, the International Association of Chiefs of Police called for 100 percent of their sworn officers and other support staff to be trained in Mental Health First Aid. To date, 182 law enforcement agencies have taken the pledge. 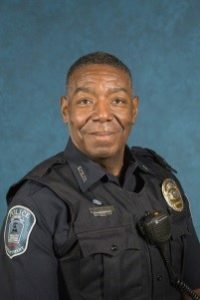 Orlando Singleton is a Law Enforcement Officer for the Kansas City, KS public school district. He is a certified Instructor for Youth Mental Health First Aid, Adult Mental Health First Aid and Mental Health First Aid for Public Safety.